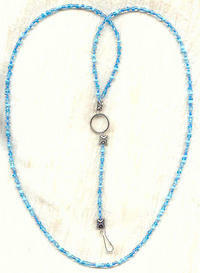 Styled for beauty and constructed for comfort and durability, our beaded lanyard necklaces are massively useful items. 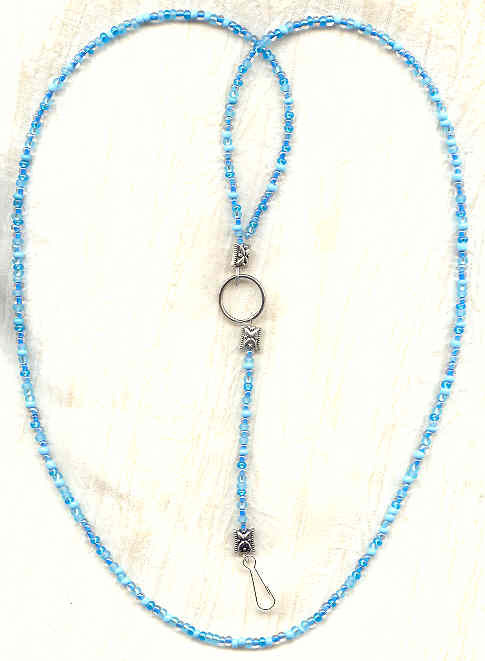 A mix of first-quality Czech light blue and green aqua opaque seed beads, and hand cast lead- and antimony-free pewter accents are strung on sturdy nylon-coated cable to make a 34" loop. The 3/4" spring ring amd the nearly 1" long clip are nickel plate. Remove the clip and 4" strand of beads from the spring ring, and you have a key holder; leave the clip in place for an ID badge holder. The spring ring also makes a handy spot to keep reading glasses: just tuck one leg through the ring and fold the glasses flat! Stylish, versatile, and a WONDERFUL gift item, they're from SPARKLE PLENTY, of course.